The pop music of the mid-1990s seems to marked by both the lack any single clear new stylistic direction, and a great number of older genres experiencing healthy revivals. These styles, some of which had fallen out of fashion for quite a while, are coming back through not only efforts of the original artists but also thanks to a surprising number of younger performers who are taking up the banner of music their parents might have listened to. The blues, Beatles-influenced pop, Memphis soul, 60-style folksingers, surf music, rockabilly, even schlocky lounge music of the late 50s -- if it experienced popularity before, chances are it's making some kind of comeback. One of the more interesting musical revivals happening at the moment, largely out of the eye of the commercial mass-market media, is 70s Southern rock in the tradition of the Allman Brothers Band, the Marshall Tucker Band, and Lynyrd Skynyrd. It's a style marked by a blend of blues often with slide guitar, a little country influence, and in the best examples, a light, flowing rhythm that borders on jazziness. One of classic Southern Rock's hallmarks is a tendency to break into extended instrumental jams, in some ways recalling the Grateful Dead, which might explain the renewed interest in the style. The Allman Brothers Band, featuring four of the original members have been back together, actively touring and recording. But there is also a bevy of younger groups who draw their influence from the Allmans and their stylistic compatriots. Some apply the more rough-edged sounds of the 1990s such as Widespread Panic and 311, but there are other groups who in some ways "out-Allman" the Allman Brothers, with exceptionally fine musicianship, great but focussed instrumental improvisations and the ability to present the best 70s Southern Rock had to offer without getting into some of its excesses or musical weaknesses. Interestingly two of the best such groups are from well north of the Mason-Dixon line -- The Freddie Jones Band from Chicago and The Hatters from New York. Last year, we had the national recording debut by a fine classic-Southern Rock band from Georgia, the Grapes. This week we turn our attention to another worthy band from the Peach State who also hold true to the same musical roots. 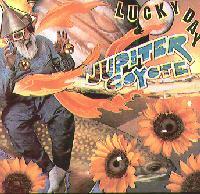 They call themselves Jupiter Coyote, and their new third CD is entitled Lucky Day. Jupiter Coyote's two guitarists have known each other for a long time. Matthew B. Mayes and John Felty met in first grade in Brevard, North Carolina, where they grew up. Seven years ago, after both Mayes and Felty moved to Macon, Georgia, they formed the band with drummer Gene Bass and more recently added bassist Sanders Brightwell and percussionist David Stephens, Jr. The group previously self-released two records on their own Autonomous label, aiming to maintain their independence from the usual music business constraints. They have sold tens of thousands of records mostly on the basis of their touring and friendly print reviews. Lucky Day is the first of their releases to make its way this far north, but it's a fine way to get to know this band who start with classic Southern Rock influences, including familiar guitar riffs, rhythmic figures and vocal approach. Then they add their own touches, including some occasional funky rhythms, and a predilection for changing direction within a piece which adds interest instead of jamming on one idea for too long. And Jupiter Coyote can certainly jam. Lucky Day has two tracks longer than Free Bird and one almost as long as the Allmans' Mountain Jam, though the latter Jupiter Coyote piece relies on an extended segment of natural sounds for some of its span. Like other Southern Rock revivalists, Jupiter Coyote brings together some excellent musicianship, perhaps not quite at the virtousic level of the Freddie Jones Band or Aquarium Rescue Unit, but very competent and most notably quite tasteful. While the group can jam, they keep things interesting with their trademark sonic shifts in mood, rhythm, chord changes, and instrumentation. The lineup is pretty standard, including two guitars, bass, drums, and a percussionist, instead of a second drummer like the Allmans. But Mayes and Felty are not afraid to go acoustic, sometimes performing with the interesting combination of an acoustic rhythm guitar backing up a very electric slide guitar solo. Mayes also plays an instrument he calls a guijo, a cross between a guitar and a banjo. The composers credits are given to all the band members, and lyrically the material is literate and competent, but Jupiter Coyote's strength lies in its instrumental playing. Mayes and Felty alternate vocals and can resemble the singing of Dicky Betts of the Allman Brothers. or the late Toy Caldwell of the Marshall Tucker Band. Lucky Day's producer was Johnny Sandlin, a veteran who worked with both the Allman Brothers and Marshall Tucker Bands. Jupiter Coyote is another of the growing number of younger bands to devote their energies to reviving 70s Southern-style rock. This Macon, Georgia-based quintet features tasteful playing, with the rhythm section especially being able to provide the easy-going, appealing beat that sets the best of this kind of music apart from other more conventional rock genres. The songs are well-written and arranged, and the band can jam without getting into one of those tedious guitar endurance tests that would sometimes mar the original Southern Rock of the Woodstock Days. Their ability to work mood changes into their tunes also oneof their strong points. In terms of audio quality the album is very nicely done. The mix is clean and free from studio clutter, while the judicious use of echo effects on the guitar adds a nice touch. And the extended rainforest portion, originally recorded by composer and natural sound collector Bernie Krause, provides a pleasant surprise. Long-time Southern rock producer Johnny Sandlin, who also engineered and mixed the album in his studio in Decatur, Alabama, did a first-rate job. With the more widespread distribution of their album Lucky Day, Jupiter Coyote joins groups like the Grapes, the Freddie Jones Band and the Hatters as another outstanding young band carrying on a rock tradition dating back over a quarter century.